In regards to Blacktooth, there are many wrinkles to iron out in this fable. The basics alone would generate a short, boring novel. In lieu of that rainy day, we will keep the discussion simple. A self-trained illustrator, Blacktooth began sketching at a young age. Inspired by Star Wars and Godzilla films, monsters and mutants dominated in the imagination – science fiction and fantasy were the earliest known sources of nourishment. As Blacktooth's nature evolved, horror movies and heavy metal records would usurp his primary infatuation. Such degenerate influences would severely impair his development. Trace elements of this juvenile content are still reflected in his work to this day. Eventually Blacktooth would develop a much finer taste for vintage paperback illustrations, as clearly outlined under the Olympus Mons section of this website. Having rejected formal training, Blacktooth now finds himself swimming through a rapidly changing and competitive world. It seems that everyone wants to be a part of the collective Star Wars universe, that every sketch artist has a new spin on Bat Man or Venom. 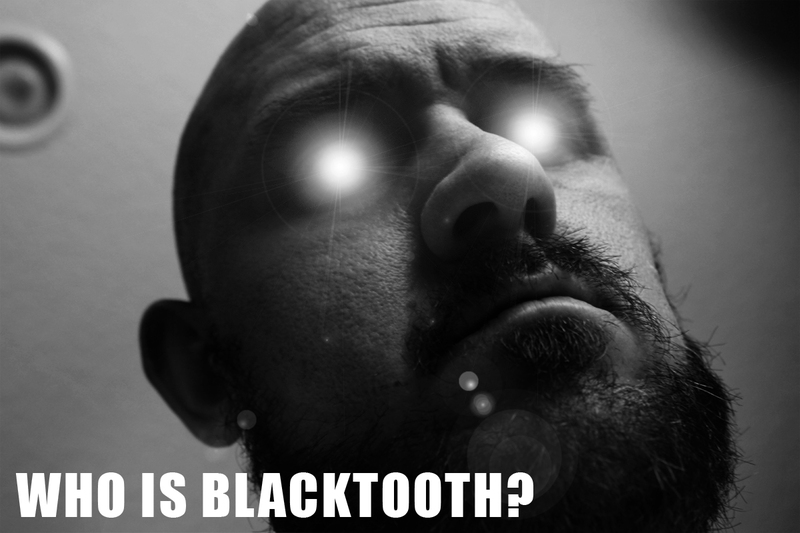 While comic books and tattoo art certainly have their place in the cosmos, Blacktooth cannot bring himself to replicate established franchise characters. Life's too short for imitation. QUESTION: Did I have a traumatic childhood? ANSWER: No. Quite the opposite in fact. I was raised in a typical American household. My parents were divorced, but they were never hostile. In fact, they were quite supportive of my creative aspirations, althought they never could understand my fascination with monsters. I was never beaten, harassed or sexually abused by adults. I was blessed to have such hard working parents. They provided the supplies and nourishment I required and managed to keep me away from destructive tendencies. QUESTION: Do I use narcotics or substances to generate all this crap? ANSWER: Negative. I do not use chemical agents to seek inspiration. My current state of euphoria is based on physical fitness, not chemical ingestion. I'm clean. But that's not to say I condemn others who choose to seek nirvana. It is not my place to judge... Although I do confess to a nice glass of whiskey on occasion. QUESTION: Do I have my own studio? ANSWER: Technically no. I have an office, but thy brain is truly my creative studio. I bring my tools wherever I go – drawing pads, pencils, pens... I work a regular job and have minimal time to accomplish my creative objectives, so I must remain mobile. It has taken me several years to flesh out the basic parameters for RepDigest. I'm barely scratching the surface here. QUESTION: Why don't you use a standardized design site like Wix or Weebly? ANSWER: Because I don't feel like wearing someone else's underwear. I prefer having complete creative control over my cumulative garbage heap. After years of fighting with HTML, I now have my own responsive tomb to exercise my craft. It may not be pretty, but hiring a professional webslinger wasn't in my budget. There are plenty of technical errors under the surface, but RepDigest is an extension of my heart. The mistakes will be fixed in due time.